April’s Food & Wine Cover Recipe looked simple enough: A fresh spring pasta that had an active cooking time of 45 minutes, no problem right? Like any untried recipe, there are always some pitfalls to making something from a magazine. This month was no exception; the search for some of the ingredients was epic! The recipe for April’s cover is themed to feature the magazine’s guest editor, the exuberant Mario Batali, famed chef and an expert on Italian food. April’s F&W revolves around various recipes created by Batali, along with amazing new Italian wine, restaurant, and hotel recommendations, and basically all things pasta! There were actually two recipes that were considered for the cover, both of which were developed by Batali, but in the end they chose Spring Pasta with Blistered Cherry Tomatoes, the main dish for this post. I also debated making the other recipe, Coppa-and-Gorgonzola Piadine, but decided against it because of time restraints on the day of the challenge. Everyone knows how much I love pasta and I was super excited to get this challenge going! 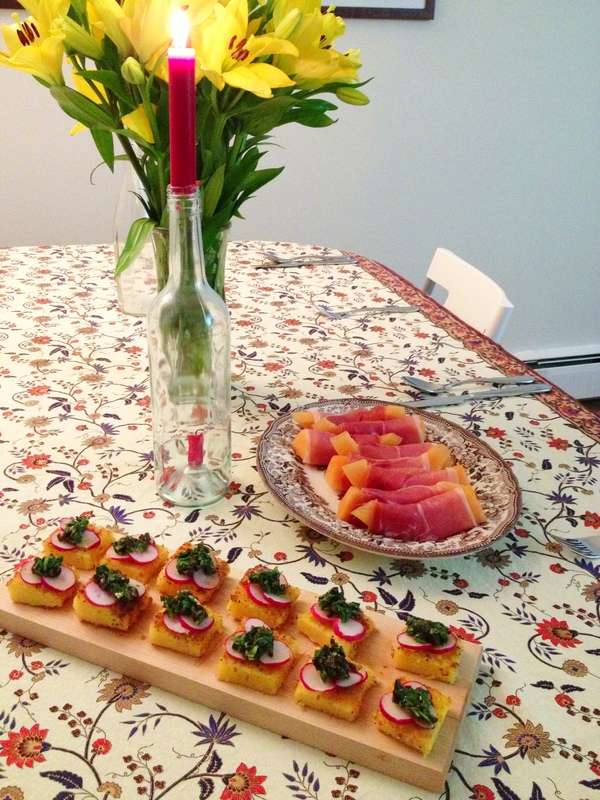 In addition to the Batali Spring Pasta, I chose to tease our taste buds with simple appetizers, one from this month’s issue, Crispy Polenta Bites with Arugula Tapenade, and my favourite apperitifi, Prosciutto Wrapped Melon. First of all: the ingredients. I have to say, when I read the list of ingredients I thought, piece of cake. Cherry tomatoes, brocolini and ricotta salata cheese all seemed like perfectly attainable components. Somehow they weren’t. I tried three different grocery stores to find brocolini, to no avail, and though the lovely lady at the cheese counter at Pete’s had heard of ricotta salata before (as opposed to the perplexed clerk at the Superstore), she told me that they rarely have it available. I actually had trouble getting the type of pasta that was required, a malfadine noodle, which ressembles a lasagna noodle, and had to settle for parpadelle and regular old brocoli. I also chose a Tuma cheese that was suggested by the cheese lady at Pete’s instead of the ricotta salata because she claimed it was similar. 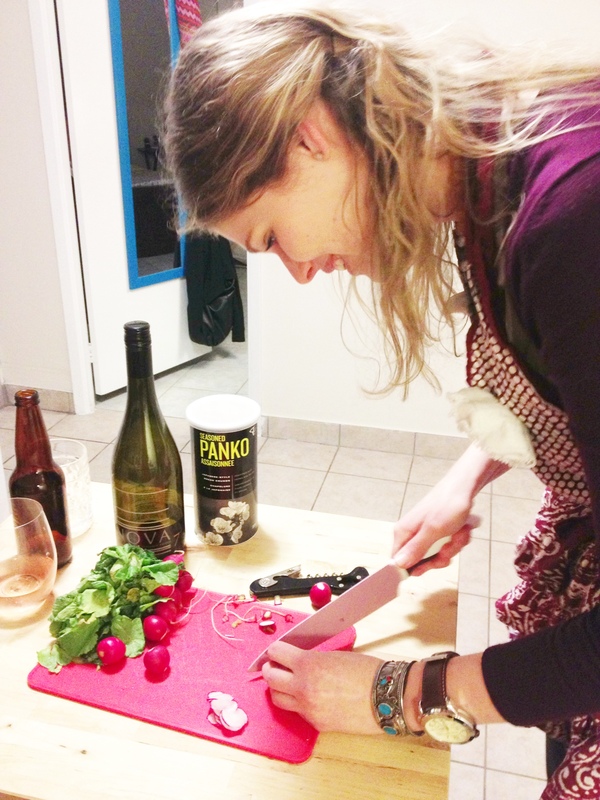 Once I had acquired all of the ingredients (or their substitutes), actually making the pasta was pretty easy. First of all we had to roast the brocoli and the tomatoes in the oven with oil, sea salt and garlic. After boiling the noodles we combined all the ingredients in the pot with the strained noodles and served immediately. In the end I did another subsitution with the cheese because when I grated the Tuma and tasted it, it had like zero flavour, so I grated some pecoriono romano to finish of the dish! Easy peesy! 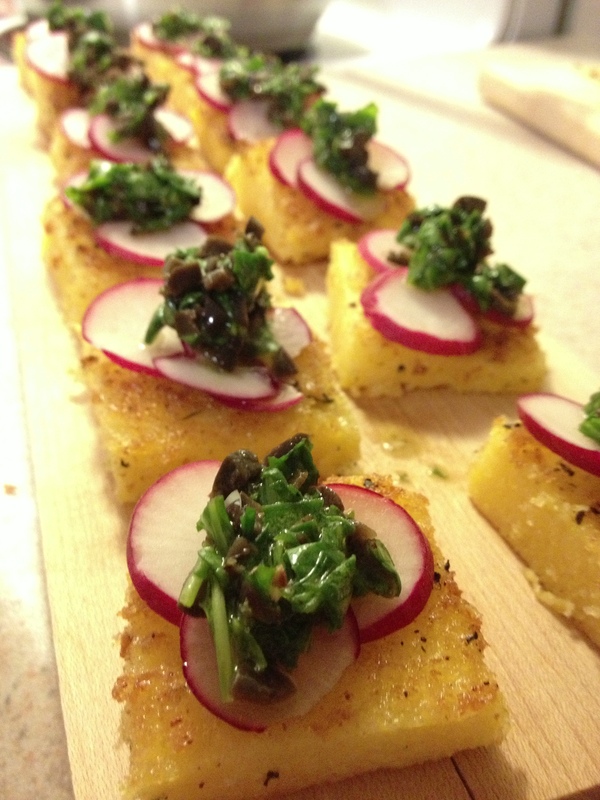 Crispy Polenta Bites with Arugula Tapenade required some more effort and took a little longer than the 7 minutes the magazine claimed it would take to make this appetizer. 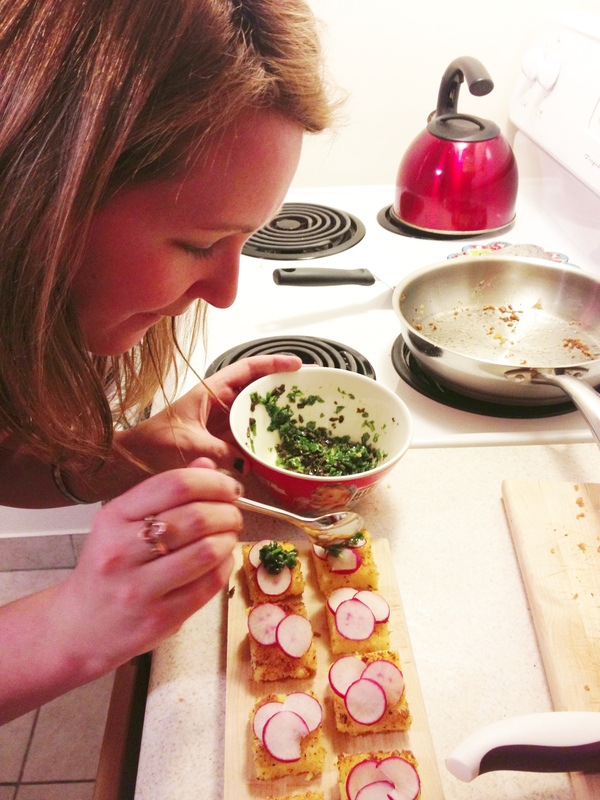 Erin assisted me by slicing up the radishes extra thin while I trimmed up the polenta and fried it on the stove with panko bread crumbs. The tapenade itself was very easy to make and required only lemon juice, arugula, olives, oil, and salt and pepper! My favourite part of this recipe (other than eating it of course) was layering the ingredients atop the polenta and making them look awesome! Once the appetizers were on the table, we could finally sit down, eat, and enjoy! The appetizers were enjoyed by all, and they vanished pretty quickly. The tapenade on the polenta was flavourful and light, and with the crunch of the radishes, was a great contrast to the heavy and rich polenta. The Spring Pasta with Blistered Cherry Tomatoes was also a big hit and was very refreshing compared to the heavy lamb stew from March’s recipe challenge. 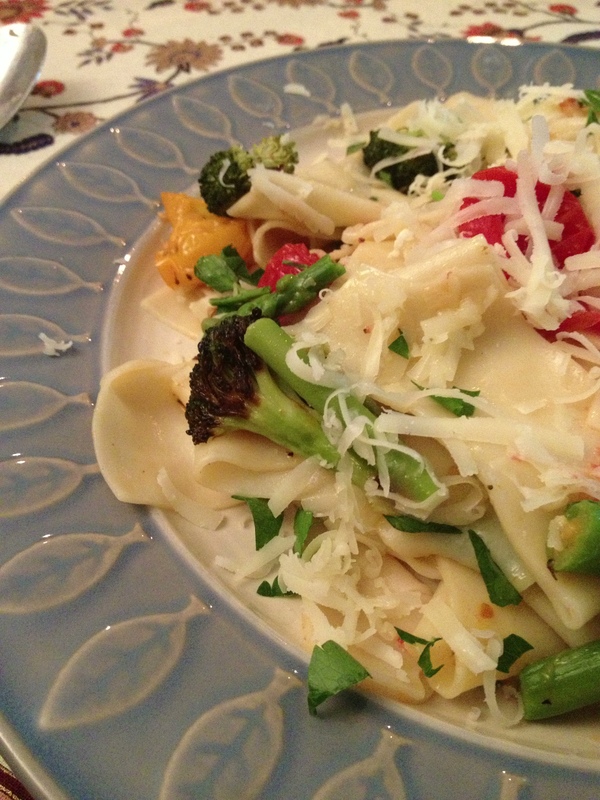 The roasted vegetables were flavourful and though everyone at the table is fan of cream sauces, it was not missed because the flavours of this pasta were just so fresh and light! For both of these recipes, I felt that white and light was the way to go to compliment the spring flavours of the dishes. 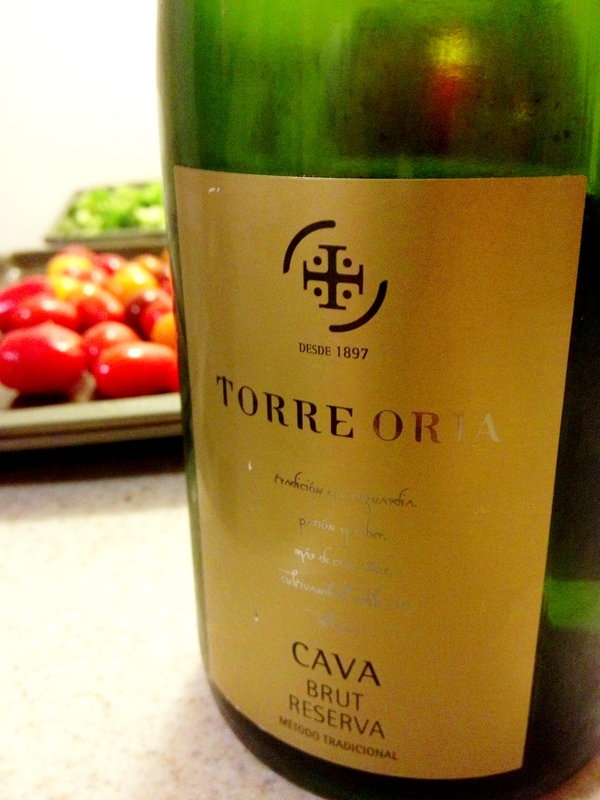 For the appetizer, I chose a Spanish sparlking wine, Torre Oria Cava Brut. It was dry, oaky and very flavourful. While Erin loved the nutty taste of the sparkling, and Adam and Matt seemed to be indifferent to its bold flavours, I really did not enjoy my Spanish sparkling experiment and probably would not have it again. I asked Erin to choose a light Italian white for the main course, as was suggested by Batali at the end of the recipe. 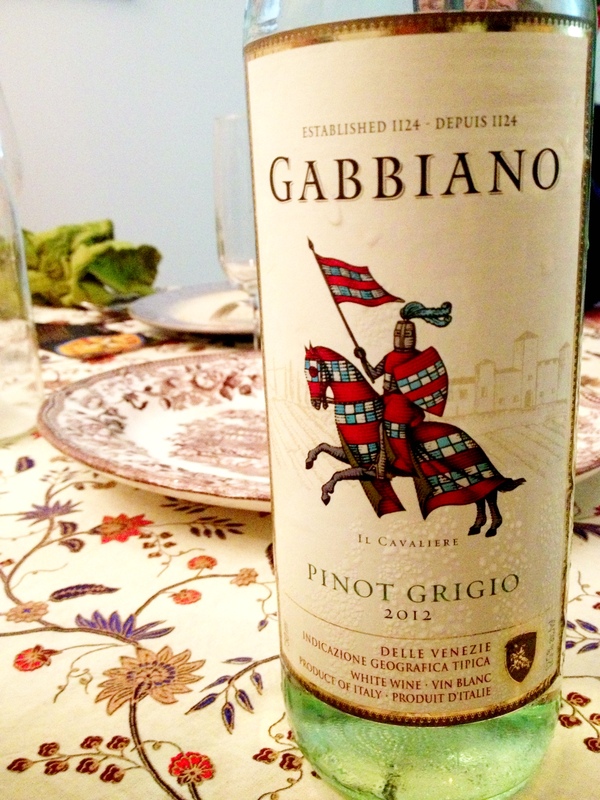 She selected the Gabbiano Pinot Grigio, which is actually one of the house wines that we served at a restaurant I worked at years ago and I knew that it would go excellently with the pasta course. The crispness of this wine accompanied the roasted veggies in the pasta excellently and paired with the pecorino romano garnish perfectly. All in all, despite the difficulty in attaining some of the ingredients, I proclaim that April’s Cover Recipe Challenge was another success. The appetizers and the main course were fresh and light and left everyone pining for an al fresco evening full of wine and great food. 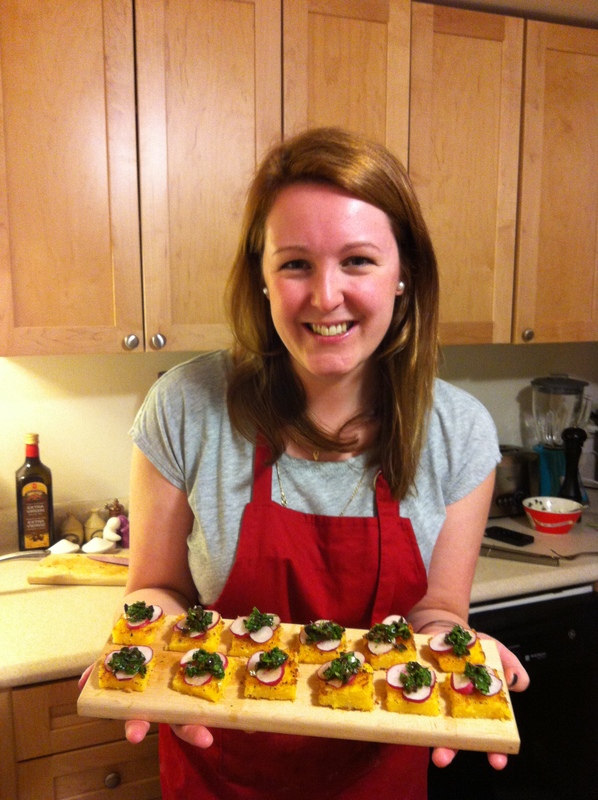 Batali’s recipes were easy to follow and made for a great evening of cooking. I will most definitely be picking up a cook book of his in the near future! Until next time, Explore. Eat. Repeat. 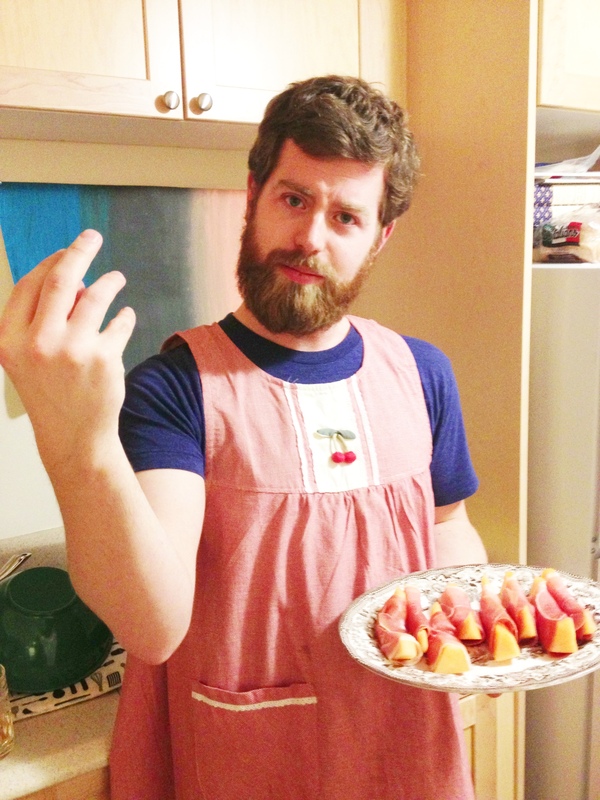 You can usually get broccolini at the Superstore, however, they don’t always have it. Which is annoying as I use it all the time.